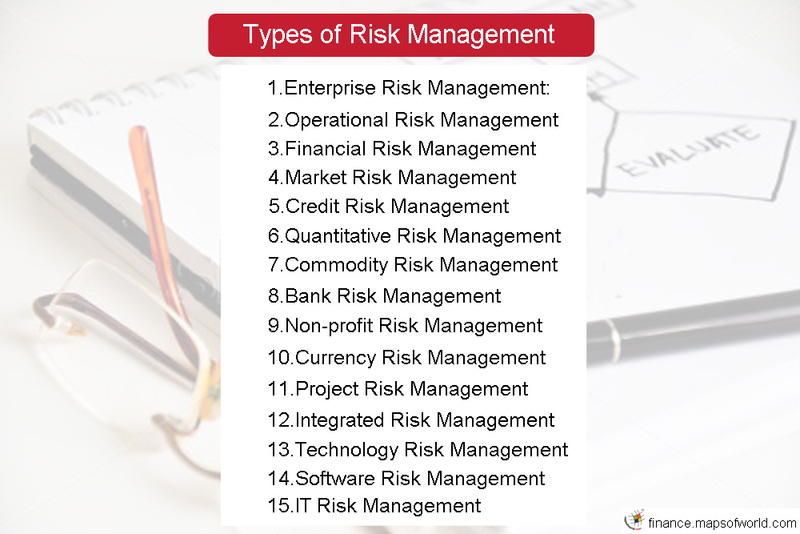 Risk Management deals with the identification, assessment and various strategies that help mitigate the adverse effects of risk on the organization. Management uses risk management as a strategic tool to mitigate the loss of property and increase the success chance of the organization. There are various kinds of risk and the risk management deals with their timely identification, assessment and proper handling. The types of risk management differ on the basis of the nature of operations of a particular organization and other factors like its overall goals and performance. All these types of financial risk management processes and risk management reports play a significant role in the growth of an organization in the long run. Commercial enterprises apply various forms of risk management procedures to handle different risks because they face a variety of risks while carrying out their business operations. Effective handling of risk ensures the successful growth of an organization. It is a strategic framework that checks the potential risks that have adverse impacts on the enterprise. These risks could be in terms of risk related to resources , product and services or the market environment in which the enterprise operates. Enterprises develop risk management capabilities to deal with these risks and a proper action plan. Enterprises must note down all the possible risks that may occur and prepare a set of action plans depending on the nature of risk. The process of financial risk management can be defined as minimizing exposure of a firm to market risk and credit risk using various financial instruments. Financial risk managers also deal with other risks related to foreign exchange, liquidity, inflation, non-payment of clients and increased rate of interest. These risks affect the financial position of the enterprise. Enterprises need to understand the risks present in the market, inherent to the industry or arising out of the competition. Enterprise needs to properly assess it and develop their capabilities . It Deals with different types of market risks, such as interest rate risk, equity risk, commodity risk, and currency risk. Managing credit risk is one of the fundamental work of the financial institution. Credit portfolio management is largely becoming essential for the enterprise to keep track of risk.It Deals with the risk related to the probability of nonpayment from the debtors. In quantitative risk management, an effort is carried out to numerically ascertain the possibilities of the different adverse financial circumstances to handle the degree of loss that might occur from those circumstances. It Handles different types of commodity risks, such as price risk, political risk, quantity risk and cost risk. It Deals with the handling of different types of risks faced by the banks, for example, market risk, credit risk, liquidity risk, legal risk, operational risk and reputational risk. This is a process where risk management companies offer risk management services on a non-profit seeking basis. Deals with different types of risks associated with the implementation of new software. It is a part of enterprise risk management as most modern enterprises largely depend on the information technologies and there are certain inherent risks associated with the technologies. Most modern enterprises need to face it and prepare plans to deal with these risks.